IFS has over the years been asked by thousands of people in all 50 states for an easily accessible and easy to use guide that helps explain their Code Compliance issues concerning FR Decorations, Interior Finishes, and Thermal Barrier Applications. With the combined efforts of many in-house and outside resources, this resource is intended for use by personnel and administrators of areas of public assembly and occupancy classifications to maintain and improve life safety conditions for the benefit of residents and employees. This document is intended to provide information to facilities, but it is not necessarily fully inclusive of all details of LSC 2000 or other NFPA Standards. Determinations of compliance with Life Safety Code regulations are made at the time of survey. Federal, State and Municipal Building Codes all have maintenance clauses pertaining to the flame retardancy of decorative materials and interior finishes when used in areas of assembly or egress. Many have established on-going maintenance cycles, protocol and recertification programs for fire-retardant materials whose cycles vary in length of time. Any flame retardant or resistant item that has had its fire resistant coating removed or has had a flammable coating (including, but not limited to airborne dust and flammable paints) applied or adhered to its surface, will have negated its flammability rating and must be, at that point, MAINTAINED to certify its original flame retardant condition. New construction and retrofits of existing facilities are also required to meet the current codes established. Certificates of Flameproofing Conformance are provided for items that meet applicable Code Standards. When Certificates of Flameproofing Conformance expire, the liabilities of the flame retardancy of those treated items are no longer the responsibility of the company originally issuing the certificate. NFPA 703 and Life Safety Code 101 for Interior Finishes clearly states that "Interior Finishes in areas of Public Assembly shall meet the required Fire Codes for that Occupancy and that the Fire Retardant properties on treated items be Maintained or Renewed as per Manufacturer's Instructions and under the service conditions of actual use, using only approved flame retardant coatings." In 2010 the Center for Medicaid (CMS) issued a Corrective Memorandum entitled "Interior Finish Documentation Requirements for Multiple Providers." Clarifies Policy on Interior Finish -- this memorandum clarifies policy regarding existing interior finish for fire safety purposes. No Requirement to Document Flame Spread Rating -- existing interior finish materials. Documentation of Flame Spread Rating Required -- only for newly installed interior finish materials. The memo states that… “Generally these finishes are renewed on a regular basis when the facility updates and refreshes its interior and can obtain the needed documentation at that time.” You can read the full text here. 806.2.6 Fire-retardant coatings. The required flame spread or smoke-developed classification of surfaces shall be permitted to be achieved by application of approved fire-retardant coatings, paints or solutions to surfaces having a flame spread rating exceeding that permitted. Such applications shall comply with NFPA 703 and the required fire-retardant properties shall be maintained or renewed in accordance with the manufacturer's instructions. 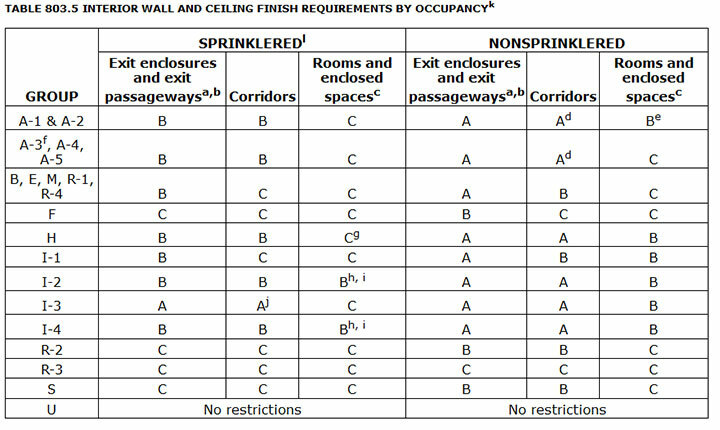 806.3 Wall and ceiling finish requirements. Interior wall and ceiling finish shall have a flame spread index not greater than that specified in Table 806.3 for the group and location designated. Interior wall and ceiling finish materials, other than textiles, tested in accordance with NFPA 286 and meeting the acceptable criteria of Section 806.2.1.1, shall be permitted to be used where a Class A classification in accordance with ASTM E84 is required. a. Class C interior finish materials shall be permitted for wainscotting or paneling of not more than 1,000 square feet of applied surface area in the grade lobby where applied directly to a noncombustible base or over furring strips applied to a noncombustible base and fireblocked as required by Section 803.4.1.
b. In vertical exits of buildings less than three stories in height of other than Group I-3, Class B interior finish for nonsprinklered buildings and Class C interior finish for sprinklered buildings shall be permitted. f. For churches and places of worship, wood used for ornamental purposes, trusses, paneling or chancel furnishing shall be permitted. j. Class B materials shall be permitted as wainscotting extending not more than 48 inches above the finished floor in exit access corridors. l. Applies when the vertical exits, exit passageways, exit access corridors or exitways, or rooms and spaces are protected by a sprinkler system installed in accordance with Section 903.3.1.1 or 903.3.1.2. Curtains, draperies, hangings and other decorative materials suspended from walls or ceilings shall be certified meet the flame spread criteria of NFPA 701 or shall be non-combustible. Buyers and Fire Inspectors should be aware of two (2) categories of Inherently Flame Retardant textiles. Those whose flammability performance is based upon Additives (FRT) at the processing stages and those textiles which are Inherently Fire Resistant such as Kevlar, Nomex and Asbestos. Both are often marketed as Inherently Flame Retardant (IFR). Unless Inherently Flame Retardant Fabrics are Truly Kevlar, Nomex or Asbestos in origin, fabrics labeled Inherently Flame Retardant could lose their Fire Resistance due to aging, humidity, laundering or airborne dust. Many older (FRT) IFR’s will not pass simple flammability field tests that are indicative of Flame Resistance. International Fire-Shield, Inc.’s Inspecta-Shield Plus fire retardant. 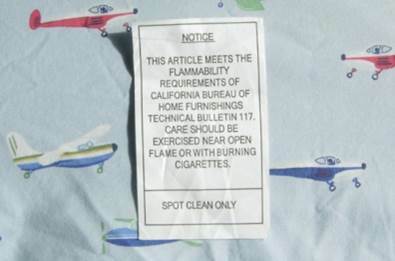 Upholstered furniture and mattresses must meet the flammability criteria as established by ASTM E 1537 or California Technical Bulletin 133 (Mattresses are required to meet California Technical Bulletin 129) The Cal Tech 133 is the prescribed test method for furniture flammability requirement in areas of public occupancy. California Technical Bulletin 117 is a mandatory standard for residential upholstered furniture. The furniture fabric covering is not tested for flammability. However, there are thousands of public occupancies that contain upholstered furnishings that only meet the Cal Tech 117 test requirements. To correct this oversight Inspecta-Shield Plus can be used to flame retard the fabric. The ICC Building Code Chapter 5 General Building Heights and Areas is the driver of assembly ratings for areas of incidental use and accessory areas in conjunction with Chapter 3. From Chapter 5 requirements can be linked to for the specified type of occupancy. As an example, if an R-4 has a change in the ambulatory occupancy and becomes classified as an I-2 the fire codes can change dramatically overnight (ICC Interpretation No. 16-03). If there is an accessible basement that is used for storage this area becomes classified as an Incidental Use area or an accessory area depending on the square feet of the area and is now a separate fire area of the structure. This area for storage is now classified as an S-1 (Moderate Hazard) or S-2 (Low Hazard) depending on the materials stored (Chapter 3 Section 311). The entire structure is now a mixed use non-separated occupancy. Chapter 5 Section 508.3.1 assists in determining if this is an Incidental or Accessory area. Chapter 3 breaks down the classification process of an S-1 and S-2. Chapter 5 section 508 Tables 508.2 and 508.3.3 can be used to determine the floor, floor/ceiling assembly hourly requirements required for this type of mixed use occupancy. The use of these tables will help to determine if a sprinkler system or hourly rated assembly is required or if both are required. There are additional sections of the Code that deal with the type of construction, size of the area below grade, number of exits to the exterior of the structure and distances to these exits that are referenced from Chapter 5 that are also used to complete the determination of the type of assembly needed. Chapter 5 is a good index starting point to determine your needs for Code Compliance in all occupancies. Fire retardant treated wood may be used in various wall assemblies, attics and roof construction, including girders, trusses, framing and decking. In October of 2010 the NFPA Technical Committee on Board and Care Facilities met to revise Section 26.2.6 Attic Protection, 26.2.3.5.6, and 26.2.3.5.7. Attics shall meet one of the following criteria: 1) Heat detection; 2) Sprinklers; 3) Non combustible construction; 4) Be treated with a Fire Retardant to meet NFPA 703. Even with Sprinkler systems the residents needed additional time to evacuate the building due to type of occupancy. When attics are used for living purposes, storage or fuel fired equipment it shall be constructed of fire retardant treated wood in accordance with NFPA 703 Standard for Fire Retardant Treated Wood and Fire Retardant Coatings for Building Materials. Accessible exposed Framing and Plywood located in attics treated with Inspecta-Shield Plus qualifies as a Class “A” finish in accordance with IBC Section 803.1.1, and Chapter 5 of NFPA 703 as listed in ICC Evaluation Report NO ESR-2019. Interior Wall, Floor, Floor/Ceiling Assemblies and Smoke and Fire Doors shall meet the hourly thermal barrier rating for the occupancy they are installed in. 302.1 General. Structures or portions of structures shall be classified with respect to occupancy in one or more of the groups listed below. A room or space that is intended to be occupied at different times for different purposes shall comply with all of the requirements that are applicable to each of the purposes for which the room or space will be occupied. Structures with multiple occupancies or uses shall comply with Section 508. Where a structure is proposed for a purpose that is not specifically provided for in this code, such structure shall be classified in the group that the occupancy most nearly resembles, according to the fire safety and relative hazard involved. Since the early 1900s, US Fire Code Regulations were regionalized within the US through ICBO, BOCA and SBCCI. 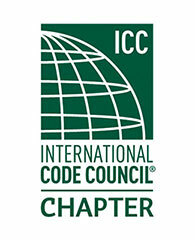 In 1994 these regional sections merged to form the International Code Council (ICC) to create a coordinated uniformity in national building codes. 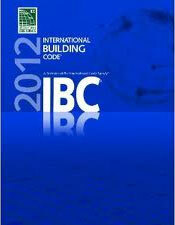 In 1997 the first edition of the International Building Code (IBC) was published by the ICC. Most States have adopted the ICC Codes or parts thereof that address Fire Code, Residential Code, Existing Building Code, and other areas. Many states and municipalities also use the NFPA 101 Life Safety Code for Fire Code Requirements. These codes establish minimum requirements based on occupancy classification. The National Fire Protection Association (NFPA) originally worked in conjunction with ICC to establish standard requirements for the IBC and other ICC Codes including the International Fire Code. Repeated failures and disputes between the two organizations over the minimum requirements to be adopted led the NFPA to withdraw from any further collective efforts of writing the IFC or other codes published by the ICC. The IFC and NFPA 101 Life Safety Code can often times be difficult to combine as occupancy classifications and requirements can differ between the two organizations and can lead to interpretation conflicts when combining the two together. International Fire-Shield, Inc. works with Code Compliance Officials to make sure that our products are accepted for use to meet your specific local Code requirements.